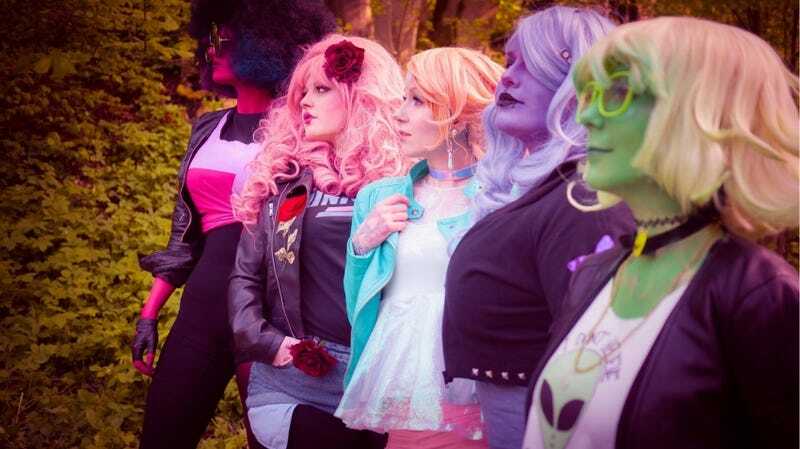 Steven Universe returns with a five-night run of new episodes on May 8, but for those who can’t wait that long to get a glimpse of the Crystal Gems... here’s some excellent cosplay that made my heart soar. Cosplayer Glasmond recently released a collection of photos from a recent group Steven Universe cosplay at German con ANIMUC, involving her and several other cosplayers. The costumes are more of a modern, punk-style interpretation of the iconic Steven Universe characters. Glasmond told io9 that’s because she and her friends wanted a way to incorporate their tattoos and unique style into the costumes. “It was a kind of spontaneous idea. I wanted to make Rose or Mystery girl, but my tattoos were in the way... [so] I decided to make an own, more punky Version. My friend Cira, who’s Pearl and very heavily tattooed, agreed,” Glasmond said.